Chemical Or Natural Insect Repellent For Babies And Kids – What Are The Risks Versus The Benefits? With mosquito-borne diseases becoming more prevalent in Australia, it’s more important than ever to keep your family protected from mosquito bites. There are so many products on the market these days that it can be hard to find the best mosquito repellent for babies and kids that is effective, affordable, and most importantly, free from harmful chemicals for the health and safety of you and your family. After learning of the potential risks associated with chemical and DEET-based repellents, we will only ever use natural insect repellents for our babies and kids. Read on to find out why! The majority of insect repellents for infants, kids and adults found on supermarkets and pharmacy shelves are filled with nasty toxic chemicals. It almost seems criminal that these companies are allowed to sell their products despite the amount of research available which shows the extent of their potential harm. Another problem with these chemical products lies in the packaging, as most of them are applied using aerosol sprays in pressurised containers, resulting in an increased risk of inhaling chemicals and getting sprayed in the eyes and face. Why Should You Opt For Natural Insect Repellents For Your Baby? The most common chemical found in mosquito repellents is DEET, a derivative of toluene, a paint thinner and adhesive solvent. This chemical is so potent and toxic that it can actually melt plastics and synthetic fibres as well as shrink leather! DEET can cause damage to the brain cells and affect the musculoskeletal system and internal organs. Do you really want to spray these chemicals and DEET based insect repellents on your older children, let alone babies and toddlers? Duke University Medical Center pharmacologist and Professor of Pharmacology and Cancer Biology, Mohamed Abou-Donia, spent 30 years researching the effects of these sorts of chemicals. He discovered that frequent and prolonged exposure to DEET can impair cell function in parts of your brain – demonstrated in the lab by death and behavioural changes in rats. 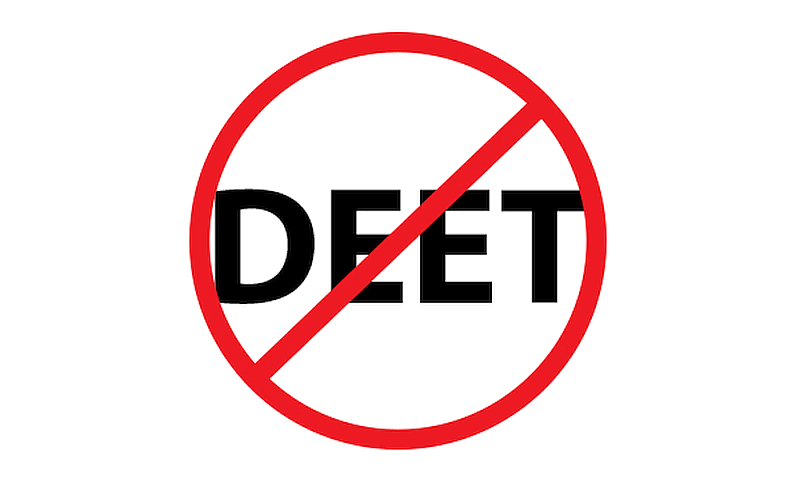 His study clearly demonstrates that ongoing and prolonged applications of DEET causes neurons to die in regions of the brain that control muscle movement, learning, memory and concentration. Following this study, he strongly recommends caution when using the insecticide DEET . Nobody wants to suffer such horrible side effects from using a mosquito repellent, as it defeats the purpose of using a repellent in the first place! With only natural ingredients, you won’t be exposed to unhealthy chemicals like DEET, which has been found to be very damaging. The therapeutic scent of essential oils masks the smell of carbon dioxide and body odour, both of which attract mosquitoes, and dramatically decreases your chances of getting bitten. The skin is the body’s largest organ and is highly sensitive and absorbent, so it’s important that we are mindful of what we put on it. The aromatic scent is a much more enjoyable smell than the chemical alternatives. Our customers love the smell of Ozzie Mozzie Repellent and Ozzie Fly Repellent. Along with being great for repelling insects, essential oils have been proven to have many health benefits like boosting your immunity, supporting digestion, balancing hormones, relieving headaches and many more, whereas numerous studies have found chemical filled repellents to be very damaging. Achieving the best mosquito protection for our babies and older kids doesn’t mean you have to stop using insect repellents altogether. With an all natural DEET free insect repellent like Ozzie Mozzie Repellent, you can keep the mosquitos at bay without compromising your family’s health and wellbeing. There are so many reasons Australians look forward to the summer months, but one of them certainly isn’t having to deal with mosquitoes. Recently, Australia has been experiencing heavy rainfall, and as a consequence a growing amount of stagnant water is being collected as we enter the summer season. 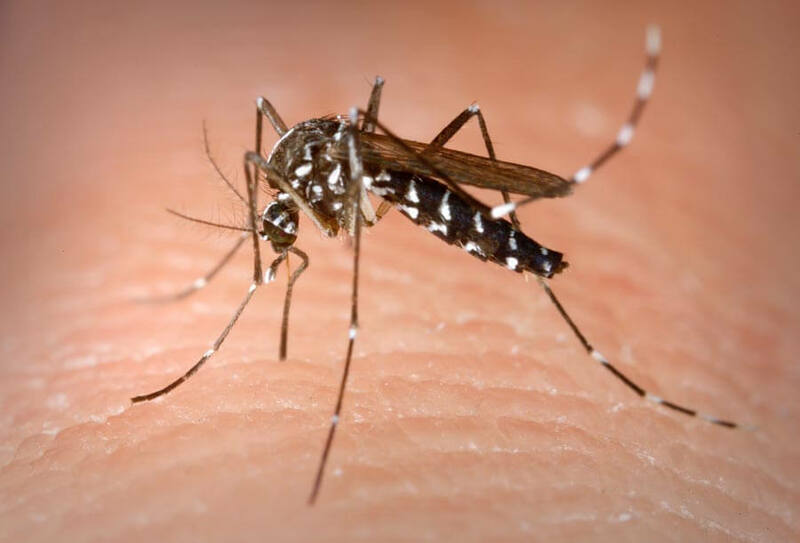 Unfortunately, this has created ideal breeding conditions for mosquitoes, increasing risks for outbreaks of mosquito-borne diseases, such as Ross River virus (RRV), Barmah Forest virus (BFV) and potentially deadly Murray Valley encephalitis (MVE). Australia has seen a big jump in the number of reported cases of mosquito-borne diseases. According to the latest WA Department of Health statistics, the number of Ross River virus cases in the Great Southern region have risen by sixfold. Perth has also experienced an increase in RRV records, with the number of cases having nearly tripled, from 27 in January and February of 2016, to 75 in the same period this year. Similarly, NSW has seen a dramatic increase in the number of reported cases of the mosquito-borne virus. In South Australia, 570 cases of RRV has been detected this year alone! Last year, there were only 69 cases. Symptoms of Ross River virus include fever, rash, joint pains, chills and headaches, but with no treatment, these symptoms can last months. Murray Valley encephalitis, in particular is another danger with 20% of those who contract it will die and 40% of those who do recover with a will have long-term neurological problems. There is currently no preventative vaccine for Ross River virus, Barmah Forest virus and Murray Valley encephalitis so the best way to reduce the risk is to avoid getting bitten. Drain any stagnant water that may be present in containers such as pots, tyres, buckets and roof gutters. Keep swimming pools and ponds well maintained and tidy. Seal water tanks and have a removable screen mesh fitted to the outlet and overflow pipes. Check fly screens, windows, doors and vents to make sure they are in good condition to prevent mosquitoes from getting inside. Trim lawns and gardens to eliminate areas mosquitoes like to rest in. Wear long, loose clothing and regularly apply repellent. Plant herbs and flowers that naturally repel mosquitoes such as basil, lavender, peppermint and rosemary. You can read more about how you can protect yourself from mosquitoes and our top tips to avoid mozzies this summer here. As we enter the summer months with an increased risk of mosquito-borne diseases due to ideal breeding conditions, it’s important that the appropriate measures are taken to reduce the spread of mosquitoes and to protect yourself. For parts of Australia, rainfall is only going to continue as summer goes on, so it is vital to be aware of the risks and remember that prevention is always the best approach. While you can’t really do much when mozzies love to bite you, having a good natural repellent and following the steps above to minimise their access to ideal breeding conditions is a great step in the right direction. Summer is right around the corner, meaning early mornings and late nights spent outside in the balmy heat. That also means, the mozzies will be out to find their next feast! With diseases like Zika virus and Ross River virus becoming more prevalent in Australia, it’s important we take the necessary precautions to keep ourselves and our families safe. To help you, we’ve put together a list of tips to ensure you and your family can have an enjoyable summer without the hassle of mosquitos and nasty viruses. Experts say, mosquitos are attracted to dark colours so while lighter coloured clothing won’t repel them completely, you have less of a chance of being targeted by them. Additionally, by covering your skin, mozzies have less area to target. As silly as it sounds, it is thought the bloodsuckers are attracted to smelly odours. By ensuring you’re clean and not consuming smelly foods (or if you really love a good blue cheese, try to indulge after dusk!) you can make yourself less attractive to the critters. For centuries, people have been using natural plant based oils, such as lavender and eucalyptus oil to repel mosquitoes and other insects. Mozzies can’t stand the strong smell of these oils and avoid at all costs! 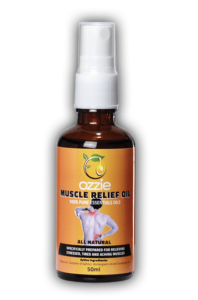 Ozzie Mozzie contains a blend of natural essential oils, which are DEET and chemical free and also help to sooth the itch if you have forgotten to spray. Mosquito nets have fine holes that allow breezes to pass through but keep the mozzies and other biting insects out. Not only do they look romantic, they also help to provide a bite free sleep. Mosquitos aren’t strong fliers, hence why they are most active in the morning and evening when there is less wind. With the use of fans, you can keep the air circulated to avoid getting bitten by a mozzie. Standing water like backyard ponds, water features, lakes, stagnant creeks, bogs, marshes and swamp are mosquito havens, especially during hot months. Most mosquitos tend to lay their eggs in stagnant water as well, so stay away to reduce your risk of encountering mosquitos or make sure garden water features are kept flowing. When in a hot and humid climate it’s important to avoid getting too hot. Mosquitos are also thought to be attracted to warm bodies; so staying cool is one way to avoid bites. Also avoid excessive exercise when possible because you will not only be radiating heat, but it will also cause you to breathe heavily. When you exhale you release carbon dioxide, which attracts mosquitos, even at relatively long distances. DEET is considered the ‘gold standard’ of mosquito repellents. Endorsed by the Centers for Disease Control (CDC), DEET doesn’t mask the smell of the host or jam the insect’s senses – mosquitoes simply don’t like it because it smells bad to them. A product containing 10 percent DEET can protect you for up to 90 minutes. The problem with DEET is the high toxicity and the % of people who have a reaction to this chemical. Two other repellents, picaridin and lemon-eucalyptus oil, have also proven effective and are now recommended by the CDC. 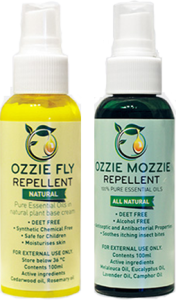 OzzieMozzie is an all-natural accentual oil based mosquito spray which does not contain the chemicals that can harm you, especially for long term use. Bacteria can be used to kill mosquito larvae. Bacillus thuringiensis israelensis (Bti) is a commercially-produced bacteria, sold in pellet and powder form, that can be laced into water where larvae live. It produces proteins that turn into toxins after the larvae eat it. Dark clothing attracts mosquitoes. Remember, they are drawn to heat and darker clothes retain more heat than light-colored clothing. Insecticides work, but only in the short term. Permethrin, one of the most common chemicals used by local mosquito control programs, kills mosquitoes on contact by disrupting their central nervous systems. However, eggs and larvae often are not affected. Once the insecticide dissipates, mosquitoes can return. Bats do not eat mosquitoes. At least, not very many of them. Mosquitoes make up less than 1 percent of a bat’s diet. And purple martins, a bird popularly believed to be a mosquito predator, eat very few mosquitoes. They prefer dragonflies and other insects. The two main mosquito predators are fish and dragonflies. Dragonfly larvae, called nymphs, eat mosquito larvae, and adult dragonflies prey on adult mosquitoes. Some towns in the United States release dragonflies every summer as a natural form of mosquito control. Mosquito traps can kill thousands of mosquitoes in a single night. One study conducted by public health researchers in Australia found that a trap caught and killed more than 44,000 female mosquitoes from 17 species in less than two weeks. Bug zappers are useless against mosquitoes. Studies have shown that less than 1 percent of the insects killed by zappers are mosquitoes or other biting insects. The devices attract and kill beneficial or harmless insects, like moths, and have no effect on the overall mosquito population. Electronic repellents have also proven ineffective in scientific testing. There is no scientific evidence that eating or drinking any particular food (e.g. bananas, garlic) can reduce the likelihood of being bitten by mosquitoes. There is no scientific evidence that taking vitamin B will reduce the likelihood of, or lessen the severity of an individual’s reaction to, a mosquito bite. Mosquitoes cannot transmit HIV or other disease-causing viruses other than specific mosquito-borne viruses. Blood type and skin colour are generally not good predictors of the likelihood of being bitten by mosquitoes. Any activity (e.g. exercise) that increases body temperature or causes sweating may increase the risk of being bitten by mosquitoes. Studies have indicated that pregnant women may be more likely to be bitten by mosquitoes due to increased body temperature. 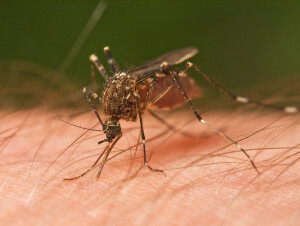 Studies have shown that the consumption of alcohol may increase the risk of being bitten by a mosquito due to increased body temperature (and perhaps failure to reapply repellent). While there will always be community and media interest in why mosquitoes appear to bite some individuals more than others, the reality is that everyone is susceptible to mosquito bites and it only take one bite for the potential transmission of disease-causing pathogens. The use of Ozzie Mozzie mosquito repellent will reduce the likelihood of being bitten and allow for a work or holiday free from worry. Look out Perth the mozzies are coming and it going to bad this year – unless Ozzie Mozzie have you covered. The chemical name of DEET is N,N-diethl-meta-toluamide and it is a derivative of toluene. Toluene is a paint thinner and adhesive solvent. Consequently it melts plastics, synthetic fibres and shrinks leather! Market research shows that over 100 million people use DEET-based insect repellents at least once a year. These repellents are available in the market in many forms, including sprays, lotions and creams. The percentage of DEET in these repellents is mostly around 10-20%, but the repellents used by the U.S. Army personnel, can contain up to 75% of the chemical. It was used extensively during WWII by the U.S. Army in the Philippines and Tropics. Mosquitoes detect you by smell of carbon dioxide, body heat and sweat emitted from your body. Repellents aromatic smell mask this odour and make it impossible for insects to detect you. It has been found that topical application of repellents containing DEET, can cause long-term side effects. This is because of the fact that nearly 50% of the chemical penetrates into the deeper layers of the skin and around 15% of it, to the bloodstream. This can adversely affect the skin and prove toxic for the body. Laboratory research conducted on animals, have shown that DEET can cause damage to the brain cells and affect the musculoskeletal system and internal organs. In humans, children are the most vulnerable, as their tender skin absorbs substances more readily. In some cases, toxic substances from repellents have been reported to affect the nervous system and even affect the growth rate. Given below are some of the potential health hazards and side effects of using chemical-based mosquito repellents. We need to use insect repellents when we are out on trips to the bush, the beach or to a country where there is a danger of insect-borne diseases. In such situations, insect repellents are our only saviour. A good way to avoid the many dangers of chemical repellents, is to go for a mosquito repellent made from natural substances such as essential oils, as used in Ozzie Mozzie. Named for its arresting stripes and aggressive nature. Not only does this fellow carry the diseases mentioned above you can add: West Nile Virus, Yellow Fever, 2 types of Encephalitis and one you may not have heard of – the “CHIKUNGUNYA VIRUS”. None of these diseases are pleasant, but this is one you don’t want to get. The word “Chikungunya” emanates from Africa and roughly translates as “that which bends up”. The symptoms are fever, muscle fatigue and severe joint pain. This arthritic pain can last up to 2 years. Cases in Australia have increased dramatically last year with most infections coming out of Bali. And the difference with the Asian Tiger Mosquito is that it will bite during the day where most of the others are active just after dusk and before dawn. Dengue Fever is another dangerous virus spread by mosquitoes. It is a problem in many tropical and subtropical parts of the world, including Africa, Asia, South America and Australia. Estimates suggest that around 100 million cases occur each year. Dengue Fever ranges in severity from a mild flu-like illness through to a severe disease. Dengue Fever can develop into the more severe forms of illness, Dengue Haemorrhagic Fever and Dengue Shock Syndrome. There is no specific treatment and no vaccine. The best way to protect against Dengue Fever is to avoid mosquito bites when in affected tropical and subtropical areas. There are 4 different viruses under the “Dengue” banner, known as DEN-1, DEN-2, DEN-3 and DEN-4. All four viruses are capable of causing the complications of Dengue Haemorrhagic Fever and Dengue Shock Syndrome. In most cases, symptoms resolve within one to two weeks. Some people, however, take longer to recover and may struggle with lethargy and depression for weeks or even months.